Much calmer seas today! Even an incredibly restful night! Another scientist, Lisa Crockett, and I were even able to manage a workout doing Pilates in the workout room. That was impressive on a ship! The water sampling continued round the clock, but was complete by the time my four o'clock shift rolled around. The temperature was dropping and the wind was stronger on deck, so it was not a day to be out looking for wildlife so much. 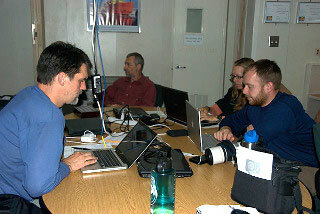 The majority of the day was spent prepping for our arrival on Palmer Station. We were expected to arrive in the morning, so we had to figure out which pieces of equipment needed to stay onboard and which needed to be unloaded to the laboratory at Palmer. The logistics of organizing the large number of people between the ship and the station was also being managed. The fishing team (O'Brien's group) would be leaving again Sunday morning at 8 a.m. to go collect fish. So we had to meet and discuss the number of fish that would ideally be collected during the fishing trip. Besides the temperature tolerance tests, samples are collected for a multitude of other physiological tests. The fishing trip will last until Wednesday at which time the ship will return and the whale group will board and head out to search for whales. They will be out approximately 12 days. This will be the process for fishing and whale tagging expeditions for three rotations each (3 days out for fishing, 12 for whales).